They say "slow and steady wins the race" and I'm hoping that is true because my card pickups for the year have been really thin. Very few Linden pickups (easily my slowest year in a decade), a handful of goalie mask, HOF autos and Cup Raisers and the odd card for sheer tradebait. I'm not disappointed by any means as I feel even more confident in my quest for cards. I go at my pace and I pick up what I want - when I want. And it seems that I want to pick up Oscar Gamble cards. It would not surprise me in the least if #WalletCard ends up being at the top of the list in terms of number of cards acquired this year. Many of them go for really good prices - compared to the crazy asking prices of some Linden offerings. It's just a lot of fun building a nice small player collection like this. Recently I have been getting help from a fellow collector who has a US address. The savings I get on shipping are immense. It's almost to the point now where any card being sold from the States goes through him. 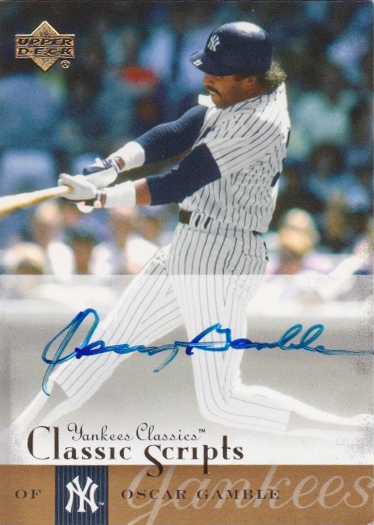 And Oscar Gamble baseball cards are tougher to come by here in Canada. My most recent cry for help (thanks again Kevin) landed me a pair of autos. Let's check out the goods. I really like this card. The uniqueness in design layout, bold name font, interesting photo placement and prime signature area combined with the old cardboard-stock, matte finish, hard-signed script has me just admiring this great piece. Yeah, there's nothing fantastic about this card - heck, there aren't even logos (no MLB license for Panini)....but it just works. The scribble is a little wobbly, but I'm ok with that. It's par for the course. I think all that this piece of cardboard is missing is a nice big afro. A sweet swing highlights this signature parallel from the mid-2000's. Not a tough card to find by any means, but to get it for the right price is where the challenge lay. The auto isn't as solid as the first card, but I chalk that up to the pen. It is what it is (stupid pen). To knock this one off the list for the price paid suits me just fine. These two cards put me at the 45-card mark out of a total of around 155 cards. 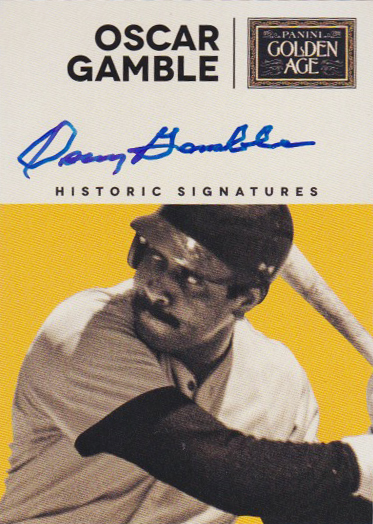 Oscar has been included in a couple recent releases - Topps Archives (5 cards) and Topps Archives Snapshots (5 cards). See....nothing crazy like 32 or 61 cards. Five. FIVE. I like that. I find that I'm leaning towards two types of #WalletCard pickups these days...autographs and stamped buybacks. I feel as though the regular base cards are easy to find any time I want. The buybacks though may only have a certain shelf life before they get tossed in the never-to-be-searched box. Luckily I've been able to land almost every buyback I've laid eyes on - and again, for a good price. Is that enough foreshadowing for my next Oscar Gamble post?